#36. 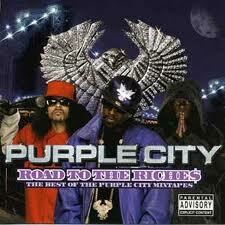 Purple City f/ Jim Jones "Purple City Byrd Gang"
Purple seats, lavender six. To really appreciate this hypnotic track, you have to watch the video. The dedication to the color purple is truly incredible: Sheist Bub wears an all-purple army suit, Un Kasa wears purple sneakers while riding on bike handlebars, and Jimmy dances in front of a white piano while holding a purple umbrella that's been turned inside out. Maybe there was some video chicanery to filter out other colors, but we don't care at all.